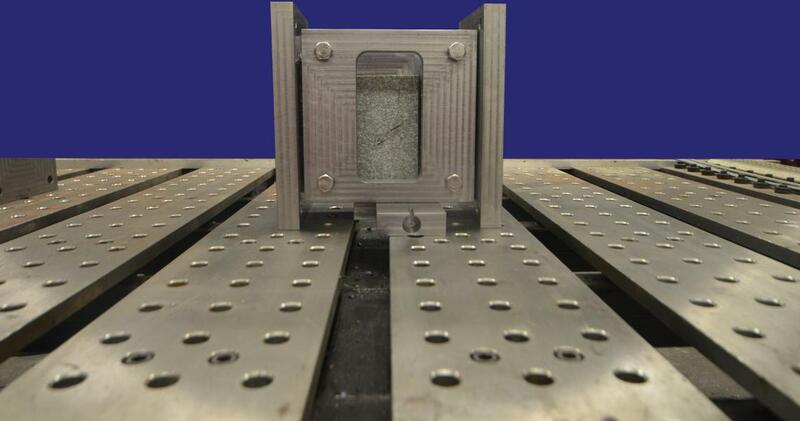 A device to study the fracturing processes of rock under real-world field stress conditions is the first scientific instrument fabricated in the newly opened Makerspace at NJIT. There is a potentially limitless supply of renewable, carbon-free energy within the Earth’s crust if we could only permeate the thick layers of crystalline rock that sit over it, barring access. So far, success in harnessing the Earth’s own heat has been mostly limited to tapping the boiling hot water that bubbles up with little prompting close to the surface. “The main challenge is to tap into deeper and less fractured hot rocks. This would make geothermal energy accessible in many more locations across the world. In order to achieve this goal, we need to fracture the rock in order to increase its permeability,” says Bruno Goncalves da Silva, an assistant professor of civil and environmental engineering who, as a doctoral student at MIT, worked with a team of researchers who contend the U.S. alone could produce 100,000 megawatts of power within the next 50 years from what is called Enhanced Geothermal Systems. To access the Earth’s heat, cold water is injected through a well into a hydraulically-fractured rock formation at a temperature of more than 200 degrees Celsius, usually at depths of more than two kilometers below the surface; the heated water is then recovered at the surface through another well, where it is used to produce electricity or heat. But engineers must first figure out how to create networks of interconnected fractures that will increase the permeability of the crystalline rock without causing major earthquakes during the hydraulic fracturing operations. With funding from the National Science Foundation, Goncalves is building a device that will allow him to study in the laboratory the fracturing processes under real-world field stress conditions. It will allow him to independently apply stresses in three directions (one vertical and two horizontal) and to simultaneously monitor the fracturing visually and through acoustic emissions. “This is the first scientific instrument we’ve made inside the new space,” says Aristides Chavez (below, right), Makerspace’s lab specialist for manufacturing and fabrication, who worked with Goncalves da Silva (below, left) on both design and fabrication. “We also made the cracks in the rock,” he adds. The acoustic emission events, or microseismic events, are monitored through eight sensors. They capture the small earthquakes that are produced when fractures develop. On one hand, these micro-earthquakes are important to understand the location and types of fractures that are produced; on the other hand, these events can't be too large, as they can cause damage at the surface to field applications. “The goal is, therefore, to produce hydraulic fractures in an efficient way without causing major earthquakes,” he notes. The same hydraulic fracturing methods could also be applied to artificially enhance the recharge of wells at shallow depths. “This may be particularly useful to increase the supply of clean water to populations in dry regions,” Goncalves da Silva notes. Gayani Karunarathna (below, right), a Ph.D. student in civil engineering who is interested in researching shale gas production, is working on the experiment.